The once ubiquitous 60W light bulb is about to plop off the production line for the last time across Europe. But while its light may be dimming, it is still illuminating many of our homes. It is at once a thing of delicate beauty and robust science. Encased in its own glass world, a miniature laboratory keeps a tiny thread of tungsten burning brightly. There is even a touch of romance in its soft flare, as it casts a painterly glow over the room and the faces of its occupants. The 60W has long been the bulb of choice for the modestly-sized rooms in the typical British home. But this very domestic species will be put on the endangered list on Thursday 1 September, when an EU-wide ban on the manufacturing and importing of 60W incandescent clear light bulbs comes into force. Customers will still be able to get hold of a 60W bulb but once stocks run out, it will go the same way as candlelight and gaslight before it. People are being forced to use energy-saving light bulbs. And no matter how much fans of compact fluorescent lamps proclaim their virtues, there will be some who will see Thursday as the day which consigned their homes to eternal dimness. Cultural historian Christopher Cook is not a fan of the new light bulbs. He says light creates an atmosphere in a room and the new bulbs give off a "different light". "We are seeing a fundamental change in the way interiors are illuminated," he says. "The light that the old bulbs cast through a lampshade is different. It's a softer, more natural light. The light is diffused through the shade." Cook is not alone in preferring conventional light bulbs - the vast majority of the 600 million light bulbs in UK homes are tungsten filaments and people are still buying them. The market share of incandescent bulbs was 56% in 2009, down from 85% in 2005, according to retail analysts Mintel. The compact fluorescent lamp accounted for 23% of the market in 2009 compared with only 3% in 2005. But the 60W tungsten bulb means more than a warm glow, it is a beacon of modernity. The "perfect demonstration of a brilliant idea" is how cultural commentator Stephen Bayley describes it. "Because it is such a very legible design, the tungsten light bulb became a symbol of switched-on genius. It's literally, as well as metaphorically, illuminating. "Its one fault? Like many a genius, it gives off as much heat as light. So it now joins tallow and the gas mantle on technology's scrapheap." He says one day the public might come to feel sentimental about its "charmless" replacement but if feels like a "poor trade" at the moment. Kerry Nicolaou, who runs a small electrical shop in west London, is trying to get his hands on as many traditional bulbs as he can. "It's getting harder and harder to collect them. I've got about two or three thousand 60Ws. "There's a lot of people who still don't like the new bulbs. Some people go for the higher wattage because they're painters and decorators and they need them to work. "Old people can't see very well, they need a strong light, but more or less any age still buys them. "This is not a democracy, it's becoming like a dictatorship, ordering you to do this, do that. You should have a choice." The 60W is the latest old-fashioned light bulb to be switched off in favour of the fluorescent lamps, energy-saving halogen bulbs and LED lights. 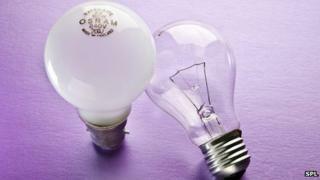 Many of the major retailers stopped selling the bulbs well ahead of the European deadlines. Bulbs of 100W and greater have already ceased production, as well as all pearl bulbs, and the same fate awaits all remaining clear incandescent lights next year. But while the higher wattages may be missed by those with bigger homes, the loss of the ubiquitous 60W may be more keenly felt. Critics continue to circle the substitutes although there is no doubt they have improved since they were first introduced. However, the bulbs have still found it difficult to shake off that reputation for giving out a dim, cold, white light. Their critics say they are slow to warm up, the light flickers, and they are too big for some fittings. There also seem to be more types than there are shapes of pasta. The proponents say these problems have already been addressed. But for the incandescent aficionados, fluorescent lights tend to be associated with morgues, prisons and tenement hallways. Cook says they give off a "cold creepiness" and make you feel like you're being interrogated. The death warrant of the conventional bulb was signed by EU leaders in 2007 to help meet climate change targets, but other countries have been thinking about it too. In New Zealand, a new government scrapped the ban in 2008, saying it was an example of the "nanny state philosophy". But the US will start banning the traditional bulbs from the start of next year and a very vocal opponent is Howard Brandston, one of the most respected lighting experts in the world who was asked to redesign the lighting of the Statue of Liberty as part of the 1986 restoration. He is against the ban on many levels, including the unsatisfactory lighting quality, the cost of retrofitting homes to use the new light sources and the safety risk posed by the mercury. Brandston has used compact fluorescent lamps in commercial projects but he says there is no place for them in people's homes. "They are not bad products, just bad applications. Your home should be your castle and they are coming into your home and reducing the quality of light and life. "It changes the colour of your appearance, your food, your furniture. They don't dim well and the colour of the light deteriorates." But for Chris Oxlade, author of The Light Bulb: Tales of Invention, it is simply a matter of scientific progression and the new light bulbs should be embraced. "I have no nostalgia for the old ones, which are knocking on 100 years," he says. "My parents will say that the new light bulbs are rubbish - they don't come on quickly enough or they are not bright enough but I have accepted them." There will certainly be people who start hoarding bulbs in earnest on Thursday, but the 60W's days will soon be over.